Change the "Qty" from 1 for 25 units. 2 for 50 units. 3 for 75 units. They come in a pack of 25 units. Fits: cupcake base diammeter of 60mm. 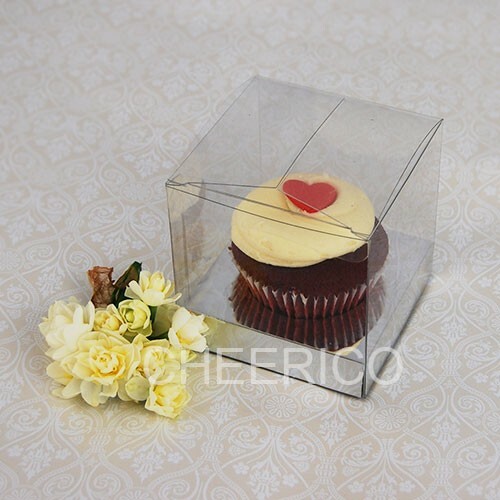 Clear plastic bomboniere wedding favour boxes are a beautiful twist on the traditional paper versions. The transparent styling allows your contents to shine through and the acetate is a little more durable, particularly for an outdoor wedding where humidity may be a factor. The white base insert has a hole that fits a cupcake with a base diameter of 60mm. One side of the insert is silver and the other side is white, so you can choose which colour to show.